From EMV chip readers to traditional terminals, we picked the best credit card readers for helping your small business’s customers. Running a small business means accepting payments from customers. You provide an excellent and useful product or service, and the customer pays you for the opportunity. But these days, customers often avoid conventional methods—like cash and checks—to pay for things. In fact, when researching the best mobile credit card readers for small business, we learned that half of customers don’t carry cash when they shop.1 That means you need to accept credit and debit cards. And with more and more customers using digital payments and chip cards, you need to take the newest types of credit card payments: NFC and EMV. But what are those? Near field communication (NFC): Also called contactless payments, NFC technology allows customers to pay with smartphones and other devices using software like Apple Pay and Google Pay. Europay, MasterCard, Visa (EMV): EMV is an internationally standardized method for making payments with microchip-enabled credit cards. EMV technology allows for greater security than traditional magstripe payments. Of course, the traditional method of storing information on credit cards, magstripe cards, hasn’t disappeared entirely. Customers swipe magstripe cards through card readers that use magnets to read the stored data. But how do you know which credit card reader is the best for your business and point-of-sale (POS) system? We looked at the best credit card readers for small business in 2018 to help you keep your customers shopping and swiping. There’s a reason we picked Square as the best mobile credit card reader and app for small business—actually, there are several reasons. Square readers connect to any iPhone, Android phone, or tablet to accept payments from just about anywhere. And our favorite Square credit card reader is the $49 Contactless and Chip Reader. It’s light, it’s compact, and it can accept EMV chip cards and NFC payments. No magstripe reader, you ask? Square also throws in a free swipe reader with every subscription. One potential drawback: you’ll need to use Square’s free mobile app and subscription service to use the reader and pay Square’s transaction fees, which are a flat 2.75%. One potential drawback: you’ll need to use Square’s free mobile app and subscription service to use the reader and pay Square’s transaction fees, which are a flat 2.75%. If you run a brick-and-mortar shop and are looking to upgrade from a simple mobile credit card reader and app, we recommend the Shopify Complete iPad Kit. It’s the best all-in-one solution for accepting credit cards, securely storing cash, and printing customer receipts. The package includes a swipe-ready and NFC- and EMV-enabled credit card reader, a cash drawer, a receipt printer, and an iPad stand. Shopify’s POS software works on iOS and Android, but the kit only comes with an iPad stand, which means you’ll need to have or purchase an iPad. And at $749, the kit equipment is much more expensive than our other credit card reader picks. But if your store needs just one permanent solution for taking every type of customer payment, it’s an excellent value. The package includes a swipe-ready and NFC- and EMV-enabled credit card reader, a cash drawer, a receipt printer, and an iPad stand. Shopify’s POS software works on iOS and Android, but the kit only comes with an iPad stand, which means you’ll need to have or purchase an iPad. And at $749, the kit equipment is much more expensive than our other credit card reader picks. But if your store needs just one permanent solution for taking every type of customer payment, it’s an excellent value. Moving from all-in-one with Shopify to one-and-done with PayAnywhere, the PAR-1 Mobile Card Reader is a simple and cheap way to take customer payments on the go. The reader isn’t as sleek or functional as the Square device—you’ll have to pay extra for a chip and NFC reader, for example—but it comes with a price tag below $10 and an affordable 2.69% transaction rate. These low costs make the PayAnywhere PAR-1 mobile card reader a smart choice for food trucks, boutique storefronts, and pop-up retailers. Mobile credit card readers and apps may be the fancy new kids on the block, but that doesn’t mean more traditional credit card terminals are entirely out of fashion. Ingenico is a reputable manufacturer of POS solutions, and its iCT220 Dual Com Terminal is one of the best credit card readers available. Customers can use EMV-enabled cards, use contactless payments like Apple Pay, or swipe their traditional magstripe cards. The reader features a bright display, easy-to-read buttons, and a PIN-obscuring privacy shield for debit card transactions. You’ll pay more for a terminal than for most mobile card readers. But you can connect the iCT220 to almost any existing POS system—via ethernet cable or cellular communication—and use any major credit card processing provider. For a simple, affordable, and versatile way to receive payments using a PC, Mac, or existing POS terminal, consider the MagTek 21040145 SureSwipe Reader. This credit card reader connects to any USB-enabled device (like a PC or POS terminal) and gets power through the same connection. Setup is just as simple: simply plug in the six-foot cable and launch your POS software—no separate drivers required. The biggest downside? The reader is for swipes only—no EMV or NFC payments allowed. Still, the SureSwipe is durable and flexible, and it can upgrade to just about any mobile POS system. Our five faves we picked above aren’t the only credit card readers out there—they’re just our favorites. But if you’re looking for more options, we uncovered five more swipe-only credit card readers that might work with your POS system. What’s the difference between a credit card reader and a credit card terminal? A credit card reader is any device that can translate the encrypted data on a credit card into information that your POS system can use to process a payment. Most credit card readers can read the information on magnetic stripe cards. Many readers can also accept EMV-enabled cards which are harder to steal information from thanks to their advanced microchip encryption. And nowadays, some readers can take contactless payments using NFC technology, allowing a customer to simply tap their smartphone or smartwatch to the reader. A credit card terminal—or payment terminal—is a type of reader that typically features a digital display and PIN pad. 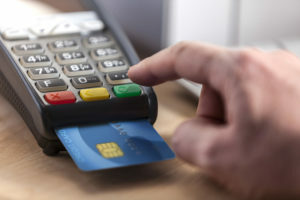 Credit card terminals usually don’t include their own POS or processing systems but instead connect to a separate system using cables or wireless technology. Terminals are best for brick-and-mortar shops, especially those that have multiple customer registers. Mobile readers are credit card machines that connect to smartphones or tablets to accept payments from anywhere you can take the reader. The readers often come packaged with a POS application and merchant services account. Mobile credit card readers are excellent for small businesses that need to take mobile payments, such as food trucks, farmer’s market merchants, or retailers with only one register. In 2015, the liability for in-store credit card fraud shifted to banks and merchants that don’t adopt EMV chip technology. That means that if you can’t accept chip cards, you could be putting your business at financial risk! Whether your small business is a traditional retailer, a roving food truck, or a nomadic pop-up shop, you need to accept customer payments on their terms. More customers than ever are going cashless, and new technology allows them to make payments without traditional credit card methods. One of our picks for the best credit card readers should let you help more customers and take more payments. If there’s a credit card reader you like better for your business—or one that we picked that you’ve used and despise—remark or sound off in the comments below. I haven’t also used any of them for business, what i have used is the service of rootgatehacks at tutanota dot come, they provide the best in cooperate espionage, real surveillance, monitoring multiple people of interest and so on. I was able to use their service twice differently and they have been great. Google them for more information.